A newly developed sensitive, fast and accurate analytical method characterized by a sensitive, fast and accuracy for the determination of oxonium ion by laser diode fluorimeter-flow injection analysis. The method is based on the libration of free iodine causing to quench the fluorescence light (continuous fluorescence from fluorescien molecule (free acid)) when irradiated by laser source at 405nm. Chemical and physical parameters were studied and optimized. The optimum parameters were 1.3mL/min using fluorescien (free acid) as a carrier stream, 35µL sample volume at valve no.1 and 39µL at valve no.2 and opened valves sequentially. Data treatment shows that linear range 0.002-0.1mMol.L-1,0.01-0.2mMol.L-1,0.002-0.5mMol.L-1,0.002-0.7mMol.L-1 for HCl, H2SO4,HClO4 and tartaric acid respectively, with correlation coefficient r= 0.9562, 0.9976. 0.9755 and 0.9579. The limit of detection (S/N=3) 1.28ng/sample, 17.16ng/sample, 3.52ng/sample and 5.25ng/sample for HCl, H2SO4,HClO4 and tartaric acid respectively from the stepwise dilution for minimum concentration of lowest concentration in linear dynamic range of the calibration gragh. RSD% for the repeatability (n=8) was ˂1% for the determination of HCl, H2SO4,HClO4 and tartaric acid with concentration 0.01mMol.L-1 . The comparison was made between the newly developed method analysis with the classical method (pH-meter) using the standard addition method via the use of paired t-test was studied at two different paths .First path a comparison between two methods of analysis and second path between the two different acids. It was noticed that there was no significant difference between different acids and different methods at 95% confidence interval level.طورت طريقة جديدة تميزت بالحساسية والسرعة والدقة لتقدير ايون الاوكسونيوم بواسطة استخدام محلل الحقن الجرياني- فلوروميتير بثنائيات وصلة ليزري.استندت الطريقة على تحرير اليود مسببا أخماد ضوء الفلورة (الفلورة المستمرة من جزيئة الفلورسين الحامضية عند التشعيع بلمصدر الليزري بطول موجي 405نانومتر). تم دراسة المتغيرات الكيميائية والفيزيائية .حيث تم أختيار سرعة جريان مثلى1.3ملليتر/دقيقة باستخدام محلول الفلورسين كتيار ناقل وحجم انموذج 35 مايكروليتر لصمام الحقن الاول و39مايكروليتر لصمام الحقن الثاني.أظهرت نتائج معالجة البيانات ان مدى الخطية لحامض الهيدروكلوريك,الكبريتيك ,البريكلوريك والترتاريك هي 0.002-0.1 مللي مول لتر-1,0.01-0.2 مللي مول لتر-1, 0.002-0.5مللي مول لتر-1 و0.002-0.7 مللي مول لتر-1 على التوالي بمعامل ارتباط (r) = 0.9562, 0.9976, 0.9755 و 0.9579 على التوالي. حد الكشف 1.28نغم/ انموذج, 17.16 نغم/ انموذج, 3.52نغم/ انموذج و5.25نغم/ انموذج من التخفيف التدريجي لاقل تركيز في منحني المعايرة. الانحراف القياسي النسبي لتركيز 0.01 مللي مول لتر-1 اقل من 1% بتكرارية لثمان مرات . اجريت المقارنة بين الطريقة المستحدثة والطريقة التقليدية ((pH-meter باستخدام الاضافات القياسية بوساطة اجراء اختبار t المزدوج بمسارين المسار الاول على اساس الاختلاف بين نوع الطريقة المستخدمة في التحليل والمسار الثاني استنادا على اختلاف مصدر الحامض ولوحظ من النتائج انه لايوجد فرق جوهري بين الطريقتين وبين مصدر الحامض المستخدم عند مستوى قناعة 95%. There are growing concerns over the possibility of transfer genetically modified sequences from genetically modified feed component (GM feed) to animals and their products, moreover, affect these sequences on animal and human health. This study was implemented to detect P35S in modified feed by using PCR technique by detecting presence P35S promoter, which responsible for the regulation of gene expression for most of the transgenic genes. Thirty eight feed samples were collected from different sources of Baghdad markets, which have been used for feeding livestock, comprise 21 coarse mixes feed, 13 pelleted feed, and 4 expanded feed. Genomic DNA was extracted by using two methods, CTAB method and Wizard kit. In order to verify the presence (P35S) in feed samples, a pair of primer for 35S promoter was used. The results of the present study showed that 58% of tested samples contained promoter P35S this means presence genetically modified feed in the Baghdad market. هناك مخاوف متزايدة بشأن إمكانية نقل تسلسلات الدنا المعدلة وراثيا من مكونات الأعلاف المعدلة وراثيا (GM تغذية) للحيوانات ومنتجاتها، علاوة على ذلك، تؤثر هذه االتسلسلات على الصحة الحيوانية، وكذلك صحة الإنسان. تم تنفيذ هذه الدراسة للكشف عن الأعلاف المعدلة وراثيا باستخدام تقنية PCR عن طريق الكشف عن وجود P35S ، المسئولة عن تنظيم التعبير الجيني لمعظم الجينات المعدلة وراثيا. تم جمع ثمانية وثلاثين عينة أعلاف من مصادر مختلفة من أسواق بغداد، التي كانت تستخدم لتغذية الماشية، وتشمل 21 من النوع الخشن 13 محبب، 4 ناعم. تم استخلاص الدنا الجينومي باستخدام طريقتين، طريقة CTAB والـ Wizared. من أجل التحقق من وجود (P35S) في عينات الأعلاف، تم استخدام زوج من البادئات لـ 35S. وأظهرت نتائج الدراسة أن 58٪ من عينات الفحص تحتوي على الـ P35S وهذا يعني وجود الأعلاف المعدلة وراثيا في أسواق بغداد. Feeding livestock --- Genetic Modified Feed --- PCR --- P35S. The aim of this study was to investigate the disturbances of some liver enzymes like GPT and GOT level in different groups of women infected with toxoplasmosis. This study was performed on 600 apparently healthy women (pregnant, miscarriage and single) collected from different hospitals in Baghdad, AL-Yarmouk Teaching Hospital and Fatima AL-Zahra Hospital for Obstetric and children and Hay Hiteen clinic during November 2013 till April 2014. The detection of toxoplasmosis was done by a preliminary screening test LAT and the positive percentage was (29.55%), (30.36%) and (40.08%) for pregnant, miscarriage and single women respectively. While, the confirmation of positive results of LAT was done by ELISA-IgG and the results were (40%), (41.81%) and (18.19%) respectively. The disturbances of GPT and GOT liver function enzymes in those women were evaluated and the result showed that only miscarriage women revealed high significant increase of GPT in comparison to all groups while there was no disturbances of GOT happened in any group of women infected with toxoplasmosis. هدفت ألدراسه ألحاليه للتحري عن الخلل في مستوى بعض أنزيمات ألكبد مثل GPT و GOT في مجموعه من ألنساء المصابات بداء ألمقوسات ألكونديه. أجريت ألدراسه على 600 أمرأه ظاهريا" سليمه مكونه من (حوامل , مجهضات وغير متزوجات ) من مستشفيات مختلفه من بغداد ( مستشفى اليرموك ألتعليمي, مستشفى فاطمه ألزهراء للنسائيه وألأطفال, مستوصف حي حطين). خلال ألفتره من تشرين ألثاني 2013 ولغايه نيسان 2014. ألتحري عن داء ألمقوسات ألكونديه تم بأجراء فحص مسحي أولي بواسطه أختبار ال LAT وكانت ألنتائج (29.55%) , (30.36 %) و (40.08%) للنساء ألحوامل وألمجهضات وألغير متزوجات على ألتوالي . بينما أظهر ألفحص ألتأكيدي ELISA- IgG للنتائج ألموجبه بال LAT نسب أخرى وهي (40 %) , (41.81%) و (18.19%) على ألتوالي. ألاضطرابات في أنزيمات ألكبد GPT و GOT في أولئك ألنساء تم تقييمه وبينت ألنتائج أنه ألمجهضات فقط تميزت بأزدياد معنوي في مستوى أنزيم GPT مقارنه بالمجاميع ألاخرى في حين لم يشهد أنزيم ال GOT أي تغيير في أي مجموعه من ألمجاميع ألمصابه بالمقوسات ألكونديه. The effect of the treatments were the combination of ozone gaz with high temperatures ( 35، 40 and 45C) and tempreture alone in addition to control treatment treatments were tested on Egges and Pupae stages of hairy grain beetle Trogoderma granarium (Everts). Results showed that( Z+H) and (H) treatments were more lethally effective (100%mortality) than to control treatment on Egges and Pupae stages of insect . The results also showed that first treatment(Z+H) was more effective than the second treatment (H) on two stages , the total killings 100% (LT100) in eggs reached at periods 15.00, 13.00 hours and 18 minutes, respectively with treatment of the ozone gaz with high temperatures ( 35، 40 and 45C),when tempreture alone showed exposure to 0.0, 0.0 and 30 minutes. Result showed also the pupae stage was more resistant than egg stage the time required to achieve 100% kill ratio is 15.00, 13.30 and 1.00 hours, respectively, and in the treatment of tempreture alone showed exposure to 0.0, 0.0 and 1.15 hours, respectively. ,the temperature alone treatment with 35,40C was not effective on Egg and Pupae while the temperature 45C alone and combined with Ozone gaz was more effective on two stages of insect .It was also found that Egg stage was more sensetive to all treatments than Pupae stage at 45 Celsius. اختبر تاثير معاملة اتحاد غاز الاوزون مع درجات الحرارة 35 ،40 و45 سيلزيه (Z+H) ومعاملة الحرارة المنفردة ((H فضلا عن معاملة المقارنة لطوري البيض و العذارى لحشرة T. granarium وجد ان المعاملتين كانتا الافضل في احداث نسب قتل عالية وصلت الى 100%(LT100) وتبين ان رفع درجات الحرارة أدى الى تقليص مدد تعرضها للقتل الكلي وان المعاملة الاولى اشد تاثيرا من المعاملة الثانية في طوري الحشرة وان درجتي الحرارة35 و 40 سيلزيه منفردة فشلت في التاثير في اطوار البيض والعذارى ، وان درجة 45 سيلزيه منفردة او متحدة مع غاز الاوزون الافضل في التاثير في طوري الحشرة وعند مختلف مدد تعرضها ، ففي الوقت الذي وصلت فيه نسبة القتل الكلي 100% (LT100) بين اعداد البيض في معاملة الاتحاد عند الدرجات الحرارية الثلاث عند المدد 15.00 ، 13.00ساعة و18 دقيقة على التوالي بلغت هذه النسب في معاملة الحرارة المنفردة عند مدد التعرض 0.0 ،0.0 و30 دقيقة وظهر ان طور العذراء من اكثر الاطوارمقاومة للمعاملات فكانت المدة اللازمة لبلوغ نسبة القتل 100 % هي 15.00, 13.30و 1.00ساعة على التوالي و في معاملة الحرارة المنفردة عند مدد التعرض 0.0 ،0.0 و1.15 ساعة على التوالي حيث لم يظهر اي تاثير لدرجات الحرارة ) 40,35 ). In this article Silver nanoparticles have been synthesized through physical method where the Nd-YAG laser has been used.The antimicrobial activities of these silver nanoparticles were investigated on two types of bacteria Escherichia coli and Staphylococcus aureus. These bacteria were used as representatives of Gram-negative and Gram-positive bacteria, respectively. Two experiments have been made The first one was to test the effectiveness of silver nanoparticles as an antimicrobial agent on Gram negative bacteria Escherichia coli and Gram positive bacteria Staphylococcus aureus, while the other one (susceptibility Test) was to evaluate antimicrobial agents effective against bacteria resistant to multiple antibiotics. This study showed that Ag-NPs that synthesized by laser ablation have a great effect on S. aureus and E. coli bacteria and have potent antibacterial activities against Staphylococcus epidarmials (antibiotic-resistant) bacteria cells . في العقد الأخير من الزمن ازداد الاتجاه حول تطبيقات الجزيئات النانوية وخصوصا الجزئيات النانوية للمعادن النبيلة كالذهب والبلاتين وبالأخص الفضة في مجالات الطب و الأدوية وغيرها الكثير. في هذه الدراسة يتم البحث حول كيفيه تصنيع جزئيات الفضة النانوية بواسطة الليزر ,وذلك بوضع الفضة النقية في مياه مقطره وقصفها باستخدام الNd-YAG ليزر .وعن طريق تغير خصائص الليزر أمكن الحصول على أحجام مختلفة من النانو فضه حيث تراوحت أقطارها من 90 نانومتر إلى 101 نانومتر . تم فحص العينات بواسطة مجهر القوة الذرية و مجهر الامتصاص الذري وقياس امتصاص الضوء لكل عينه للكشف عن شكل وحجم دقائق الفضة النانو. .لقد تم دراسة تأثير الفضة على البكتريا المرضية من نوعEschericha coli و Staphylococcus aureus حيث استخدمت تلك البكتريا كممثله عن البكتريا السالبة لصبغه الكرام والبكتريا الموجبة لصبغه الكرام على التوالي . أظهرت النتائج نسبه النجاح في القضاء على تلك البكتريا وتدميرها وان من الممكن استخدام محلول النانو فضه في تعقيم الجروح والقضاء على البكتريا .وتم أيضا مقارنه فعالية جزئيات النانو فضه وتأثيرها على البكتريا بأنواع أخرى من المضادات الحيوية حيث أظهرت النتائج أن جزئيات الفضة كان لها التأثير الأفضل في القضاء على تلك البكتريا . كذلك أظهرت النتائج انه من الممكن التحكم في حجم جزئيه النانو فضة عن طريق التحكم في الطول ألموجي لليزر حيث إن الطول ألموجي 1064 نانومتر اظهر أكفأ النتائج من الأطوال الموجية (355 و532) نانومتر في الماء المقطر عند تثبيت بقيه خصائص الليزر وكذلك إن التردد العالي 6هرتز كان أكثر كفاءة من التردد المنخفض 1 هرتز في إنتاج جزيئات الفضة النانوية عند تثبيت بقية العوامل و كذلك إن الطاقة العالية تولد جزيئات أكثر من الطاقة المنخفضة عند تثبيت بقيه العوامل. دلت النتائج على أن تأثيرات عدد النبضات على جزئيات الفضة النانوية في 400 نبضة كانت أعلى مما في 200 نبضة . حيث ازدادت عمليات الامتصاص بازدياد عدد الجزئيات النانوية في الماء المقطر . وعند الحصول على النتائج ألمختبريه لتلك العينات و دارسة تأثيرها على البكتريا تبين أن للفضة فعالية كبيره في القضاء على البكتريا وعلى عده أحياء مجهريه يمكن أن تهدد تواجد البشرية . Water Quality Assessment, and Suitability for Irrigation Purposes of Lesser Zab River, Northern Iraq. This research was conducted to investigate the water quality of the lesser Zab river, to evaluate the water suitability for agricultural usings and report the effect of human activities on this water. Samples were collected along the river stream starting from Dukan area till the convergence with Tigris River. All the tests were conducted at the labs of Environmental sciences and Technology College / University of Mosul and Erbil water project/Erbil city. The results of using Piper diagram showed that the water is alkine, due to the effect of the origional rock's components of that area on the water quality. While the using of Stiff diagram elucidate that the water samples contain ions belong to the area of the lesser Zab crossing which have carbonic formation. The using of Richard diagram showed that the quality of the water in all the samples tested, is good and suitable for irrigation. Also the water of the lesser Zab showed no signs of polluted effects on the Tigris river after converging due to the length of the lesser Zab and the dilution happening to its polluters along its path. يُعنى هذا البحث بدراسة نوعية مياه نهر الزاب الاسفل حيث تم جمع النماذج على طول مجرى الزاب الاسفل ابتداءا من منطقة دوكان وحتى الملتقى مع نهر دجلة، لتقييم نوعية المياه لغرض الأستعمالات الزراعية وبيان مدى تأثير النشاطات البشرية على نوعية مياه النهر، وأجريت التحاليل بمختبرات كلية علوم البيئة وتقاناتها-جامعة الموصل وفي دائرة مشروع ماء أربيل/مدينة أربيل. تبين من النتائج المستحصلة من إستخدام تصنيف بايبر إن مياه نهر الزاب الأسفل بفعل تأثير مكونات الصخور الأصلية للمنطقة على نوعية المياه أنها مياه (ذات طبيعة قلوية) ونتج من إستخدام مخطط ستيف أن نماذج منطقة الدراسة بماتحتويه من أيونات مياه تابعة لمنطقة ذات تكوين كاربوني والتي تمثل منطقة عبور نهر الزاب الأسفل. إن نوعية المياه في جميع نماذج الدراسة كانت بعد إستخدام مخطط ريجارد (جيدة وصالحة لري المزروعات) ولا يوجد لها أي تأثيرات خطيرة تُذكر، كما أن مياه نهر الزاب الأسفل لم يلاحظ عليها تأثيرات ملوثة على نهر دجلة بعد الإلتقاء معه نظرا لطول نهر الزاب الأسفل والتخفيف الحاصل لملوثاته اثناء مساره. Water quality --- the lesser Zab river --- stiff diagram. Leishmania are protozoan parasites belonging to the family Trypanosomatidae that cause high morbidity and mortality levels with a wide spectrum of clinical syndrome. This study aimed to investigate the effect of liposomal amphotericine B (AmBisome) drug on promastigote and axenic amastigote stages of Leishmania donovani isolate (MHOM/IQ/2005/MRU15)in comparison with pentostam SbV drug. Different concentrations of AmBisome and SbV drugs were investigated against Leishmania donovani promastigote and axenic amastigote. The IC50 values of SbV and AmBisome drugs on promastigote were10.12 mg/ml and 2.21µg/ml, respectively, while they were 0.77µg/ml for axenic amastigote for both drugs. The present study concluded that axenic amastigote was more sensitive than promastigote against both drugs, and AmBisome drug showed high effectiveness against both stages with low concentrations in comparison with pentostam.الليشمانيا طفيليات ابتدائيه تعود الى عائلة المثقبيات التي تسبب معدلات عاليه من الامراضيه والوفيات مع مدى واسع من الاعراض السريريه .هدفت الدراسه الى اختبار فاعلية عقار الامفوترسين الشحمي على الطور امامي السوط وعديم السوط خارج الخلوي لليشمانيا الاحشائيه. تم الحصول على العزله الاحشائيه من وحدة البحوث الطبيه في كلية الطب جامعة النهرين .اختبرت تراكيز مختلفه من عقار البنتوستام والامفوتيرسين الشحمي ضد الطورين الامامي السوط وعديم السوط خارج الخلوي من اللشمانبا الاحشائيه و كانت قيم IC50لهذين العقارين 10.12ملغم /مل و2.21 مايكروغرام /مل للطور الامامي السوط على التوالي بينما كانت قيمها 0.77 مايكرو غرام /مل للطور عديم السوط لكلا العقارين. اظهرت النتائج ان الطور عديم السوط خارج الخلوي اكثر حساسيه تجاه العقارين من الطورامامي السوط, وأن الامفوتيرسين الشحمي فعال ضد الطورين وبتراكيز اقل منها للبنتوستام. AmBisome --- pentostam --- visceral leishmanasis --- axenic amastigote. Evaluation of the Efficacy of Different Serological Methods (rK39 dipstick, ELISA and IFA) Techniques in the Diagnosis of Visceral leishmaniasis. The objective of this study was to compare the sensitivity and specificity of rK39, ELISA and IFA tests for the diagnosis of visceral leishmaniasis using blood samples. Samples were collected from 146 suspected patients and 30 healthy individual as control. The results showed 52 (35.62%), 58 (39.73%) and 71 (48.64%) positive samples by rK39, ELISA and IFA , respectively. IFA test showed a higher sensitivity (48.63%) than ELISA and rk39 dip stick (39.72%) and (35.61%) respectively. The highest sensitivity of agreement (K: 0.912) was found between rK39 dipstick and ELISA. Therefore, we suggest the application of rK39 dipstick and ELISA methods in endemic areas of visceral leishmaniasis for early and accurate diagnosis of this disease.تهدف هذة الدراسة مقارنة الحساسية والنوعية لثلاث طرق مصلية (دب ستك ,ايلايزا وايفا ) من اجل تشخيص الاصابة باللشمانيا الاحشائية .تم جمع عينات الدم من 146 شخص مشكوك باصابتهم بهذا المرض و30 شخص اصحاء كمجموعة مقارنة. اظهرت النتائج 52(35.62%), و 58(39.73%) و 71(48.64%) في الاختبارات الثلاث (دب ستك ايلايزا وايفا) على التعاقب.اختبار ايفا اظهر اعلى حساسية (48.63%) من دب ستك والالايزا (39.72%) (35.61%) على التعاقب. تم حساب قيمة كابا بين كل اختبارين من هذة الاختبارات الثلاثة بين دب ستك وايلايزا,دب ستك وايفا وايلايزا وايفا, اعلى قيمة كابا كانت بين دب ستك وايلايزا.استنتج من هذة الدراسة ان الدب ستك مع الاليزا هي افضل الطرق المصلية لتشخيص الاصابة باللشمانيا الاحشائية. Visceral leishmaniasis --- rK39 Dipstick --- ELISA --- IFA. This study covered approximately 150 km from the northern part of the Euphrates River in Iraq. Water and phytoplankton samples were monthly collected from six selected stations from April 2013 to March 2014; three stations were distributed within Hadithah Reservoir, while the three others were in the river's inflow. Water physical and chemical parameters and the phytoplankton community structure were analyzed. The most important results of this study were the diagnoses of 355 phytoplankton species belong to eight phylums. Algal class Bacillariophyceae which belong to phylum Ochrophyta was the most qualitative and quantitative dominant in all stations over the study period. The stations within the reservoir were characterized by higher number of genes and species, which led to higher Shannon-Weaver diversity index values in comparison to other stations. Water quality were evaluated by using the mentioned diversity index and Palmer's pollution index, stations 1 which is located in the river before the reservoir were with low levels of pollution; stations 2, 3 and 4, which are located inside the reservoir and station 5 (downstream the reservoir) were likely polluted, while the organic pollution in station 6 was confirmed because it's location close to the sewage discharge. The study concludes that Palmer's pollution index was more accurate than diversity index for the evaluation of water pollution levels.شملت الدراسة ما يقارب 150 كم من الجزء الشمالي لنهر الفرات في العراق, حيث جمعت عينات المياه والهائمات النباتية شهرياً من ستة محطات مختارة بدءاً بشهر نيسان 2013 ولغاية آذار 2014, وزعت المحطات بواقع ثلاث محطات في مجرى النهر وثلاثة أخرى ضمن خزان حديثة. تم دراسة العوامل الفيزيائية والكيميائية وكذلك تركيب مجتمع الهائمات النباتية في تلك المحطات. ومن أهم نتائج هذه الدراسة هي تشخيص 355 نوعاً من الهائمات النباتية تعود إلى ثمانية طوائف, كان لشعبة الطحالب العصوية Bacillariophyceae التي تعود إلى طائفة الـ Ochrophyta السيادة المطلقة كماً ونوعاً في جميع المحطات وطيلة فترة الدراسة. اتسمت المحطات داخل الخزان أرتفاعاً ملحوظاً في عدد الأنواع والأجناس مما أدى إلى ارتفاع قيم معامل شانون- ويفر للتنوعShannon–Weaver Diversity Indexفيها مقارنة بالمحطات الأخرى. صنفت مياه المحطات وفق معامل التنوع المذكور وكذلك معامل بالمر للتلوثPollution Palmer'sIndex, وكانت مياه المحطة1 التي تقع في مجرى النهر قبل دخوله الخزان ذات مستويات متدنية للتلوث, أما المحطات 2 و 3 و 4 التي تقع داخل الخزان فكانت مياهها من المحتمل أن تكون ملوثة وكذلك المحطة 5, بينما المحطة 6 فأن تلوثها العضوي كان مؤكداً لموقعها القريب من مصدر الصرف الصحي, كما وتؤكد ذلك الفروق المعنوية للعوامل الفيزيائية والكيميائية المدروسة في تلك المحطة مقارنة مع المحطات الأخرى. ومن خلال نتائج هذه الدراسة يمكن الاستنتاج بأن معامل بالمر للتلوث هو الأدق في تقييم مستويات التلوث مقارنة بمعامل التنوع. Twelve albino mice was divided randomly into four groups comprising A through D injected with ceftazidime at sub MIC, Escherichia.. coli 11, Escherichia.. coli 11 with ceftazidime solution, and standard strain, respectively. Histopathological sections did not show any changes in respect to group A. however, group C suffered signs of infection less than those appeared in group B sections. Simultaneously, group D suffered intense histpathological changes more than other groups infected with resistant isolate.هدفت الدراسة الى مقارنة بين بكتريا E. coli التي تمتلك مقاومة لمضاد السيفتازديم والحساسة له ، حيث استعمل في هذه التجربة اثنتا عشرة فأرة قسمت بشكل عشوائي إلى اربع مجاميع المجموعة الأولى حقنت بالمحلول الفسلجي مع مضاد السيفتازديم (بالتركيز تحت المثبط الادنى) و المجموعة الثانية حقنت بالعزلة Escherichia.. coli 11 المقاومة لأكبر عدد من المضادات قيد الدراسة و المجموعة الثالثة حقنت بالعزلة 11 E. coli مع مضاد السيفتازديم (بالتركيز تحت المثبط الادنى) اما المجموعة الرابعة فقد حقنت بالعزلة الحساسة لوحدها. لم يظهر الفحـص النسيجي اي تغيرات نسيجية في الكلية والمثانة لفئران المجموعة الاولى. و وجد من خلال الدراسة الحالية أن التغييرات النسيجية في فئران المجموعة الثالثة كانت اقل من تلك التي شوهدث في فئران المجموعة الثانية. في ذات الوقت لوحظ ان العزلة الحساسة احدثت تغييرات نسيجية شديدة في كلى و مثانة الفئران اكثر مما احدثته العزلة الحاملة لمورثات المقاومة لمضادات البيتا لاكتام. In this study found treatment mice exposed to CCl4 with the alcoholic extract of Pleurotus ostreatus (P2) at (25) mg/ml appeared to exert a beneﬁcial eﬀect since the activities of catalase, was signiﬁcantly (p<0.05) higher in liver treatment with alcoholic extract of P. ostreatus (P2) (37.290+2.638) µmol/mg than in aqueous extract for the same fungus (36.557+2.231) µmol/mg. Super oxide dismutase (SOD) was signiﬁcantly (p<0.05) higher in liver treatment with alcoholic extract of P. ostreatus (P2) at (25) mg/ml (17.863+0.454)U/mg than in aqueous extract (17.863+0.454) U/mg for the same fungus and same concentration. Glutathione peroxidase (Gpx) was signiﬁcantly (p<0.05) higher in liver treatment with alcoholic extract of P. ostreatus(P2) at (25) mg/ml (29.260+1.666)µmol/mg than in aqueous extract (24.660+1.130)µmol/mg for the same fungus and same concentration. Alcoholic extract of P .ostreatus (P2) at (25) mg/ml induce a non-apoptotic, apoptosis was (0.0657+0.0047%) ,in aqueous extract was (0.0770+0.0060%). Histopathological study appeared liver cells exposed to CCl4, CCl4 made severe degeneration and necrotic change in liver parenchyma by evidence of apoptosis in some hepatocytes , in sinusoids showed slight congestion with blood vessel and thrombus formation. Liver cells of mouse exposed to CCl4 and treated with alcoholic mushroom extract and appeared the liver cells returned like control. the tissue treatment by aqueous extract of P.ostreatus (P2) at (25) mg/ml appeared mononuclear cells aggregation.في هذه الدراسة وجد علاج الفئران التي عرضت الى رابع كلوريد الكاربون بالمسخلص الكحولي للفطر Pleurotus ostreatus (P2) اعطت نتائج افضل من المستخلص المائي فقد كانت فعالية انزيم الكتليز (37.290+2.638)مايكرومول لكل ملغرام للمستخلص الكحولي Pleurotus ostreatus (P2) بتركيز(25) ملغم لكل مليلتر اما فعالية الانزيم للمسخلص المائي لنفس الفطر وبنفس التركيز كانت (36.557+2.231) مايكرومول لكل ملغرام اما فعالية انزيم سوبر اوكسايد ديسميتيز للمستخلص الكحولي Pleurotus ostreatus (P2) بتركيز(25) ملغم لكل مليلتر (17.863+0.454) وحدة بروتين لكل ملغرام من الانزيم اما في المستخلص المائي كانت الفعاليه لنفس الفطر وبنفس التركيز(17.863+0.454)وحدة بروتين لكل ملغرام انزيم اما فعالية الانزيم كلوتاثايون بيروكسديز في المسخلص الكحولي Pleurotus ostreatus (P2) بتركيز ((25 ملغرام لكل مليلتر (29.260+1.666) مايكرومول لكل ملغرام في المستخلص المائي كانت فعالية الانزيم لنفس الفطر وبنفس التركيز(24.660+1.130)مايكرومول لكل ملغرام اما الابوبتوساس للمستخلص الكحولي (0.0657+0.0047%) اما بالمسخلص المائي . (0.0770+0.0060%) اما الدراسة النسيجية اوضحت ان خلايا الكبد التي تعرضت لرابع كلوريد الكاربون اصابها تنخر وتخثر وتغيرات في برنكيما الكبد وظهور بعض خلايا الكبد اصيبت بالموت المبرمج .عند المعالجة بالمستخلص الكحولي تظهر خلايا الكبد وكأنها رجعت لحالتها الطبيعية اما العلاج بالمستخلص المائي نلاحظ تجمع للخلايا وحيدة النواة . In this study, detection of uricase production from Pseudomonas aeruginosa isolates was done by applying colorimetric method, Uricase was purified from the most potent isolate by precipitation using ammonium sulphate (80% saturation) then purification was achieved using DEAE –Cellulose ion exchange and Sepharose 6B gel filtration chromatography column, 16.4% of total enzyme was recovered with specific activity 2337.5U/mg and 22.21folds of purification. Characterization of uricase involved detection of optimal conditions for uricase activity, the maximal activity was obtained at temperature 45ºC,while uricase appeared to be stable at 40ºC. Uricase showed optimal activity at pH 9 while pH stability was in the range of 7.5-9. Molecular weight of uricase obtained in this study determined by sodium dedosyl sulfate electrophoresis (SDS-PAGE) technique was approximately 35kDa. في هذا البحث تم انتاج انزيم اليوريكيز من بكتريا Pseudomonas aeruginosaكمياً باعتماد الطريقة االلونية كما تم تنقيته باستخدام الترسيب بملح كبريتات الامونيوم عند نسبة اشباع 80% ثم كروماتوغرافيا التبادل الايوني باستخدام المبادلDEAE-Cellulose والثانية باستخدام كروماتوغرافيا الترشيح الهلامي باستخدام هلام Sepharose 6B حيث تم الحصول على نسبة ارجاع بلغت16.4 % من الانزيم وفعالية نوعية 2337.5وحدة/ملغم وبعدد مرات تنقية بلغت22.21 . اظهر الانزيم فعالية مثلى عند درجة حرارة 45درجة مئوية ثباتية عند 40 درجة مئوية وفعالية مثلى عند الاس الهيدروجيني 9 والثباتية عند اس هيدروجيني تراوح بين7.5-9)) و قدر الوزن الجزيئي للانزيم بتقنية الترحيل الكهريائي باستخدام الاكريل امايد المتعدد SDS-PAGE حيث بلغ الوزن الجزيئي للانزيم تقريبا 35 كيلودالتون. Uricase --- P.aeruginosa --- Quantitative screening --- Purification --- Characterization. The Effect of 650 nm Diode Laser on Growth Curve of Gram-negative Bacteria and Their Phagocytic killing Assay by PMN Cells. Nowadays laser in medicine is a rapidly growing field in both researches and applications and many studies have been done in bacteriology against different types of lasers. The effect of the laser depends on many factors, one of the laser factors was the wavelength. The red wavelength band has been considered as a stimulated wavelength for prokaryotic and eukaryotic cells. In this study, three clinical species of Gram-negative bacteria (E. coli, Proteus mirabilis, and Pseudomonas aeruginosa) were exposed to 650 nm band of red region wavelength by a diode laser. The effect of that wavelength appeared on the growth curves for each species along 3 days after laser treatment. The energy density (E.D.) 2.8 J/cm2 gave a positive effect on growth curve for these three species, while the 5.6 J/ cm2 have a stimulation effect on both P. aeruginosa and E. coli. The Phagocytic killing Assay (PKA) by PMN cells was tested against irradiated bacteria, and the 2.8 J/cm2 appeared to have a significant (P<0.05) effect on PKA of all that three types of bacteria, on the other hand the 5.6 J/cm2 affected significantly (P<0.05) on the PKA of P. mirabilis, and P. aeruginosa. These findings suggested that the E.D. 2.8 J/cm2 was much effective than the 5.6 J/cm2 on the growth curves and PKA values of the three bacteria species. في هذه الايام يعتبر استخدام الليزر في الطب من المجالات النامية على الصعيدين البحثي و التطبيقي و الكثير من الدراسات اجريت على البكتريا باستخدام انواع مختلفة من اجهزة الليزر. تاثير الليزر اعتمدت على العديد من العوامل, احد عوامل الليزر هو الطول الموجي المستخدم. تعتبر حزمة الطول الموجي الأحمر من الاطوال الموجية المحفزة للخلايا الأولية والحقيقية النواة. في هذه الدراسة تم تعريض ثلاث انواع من البكتريا السريرية السالبة لملون الغرام (الاشريكية القولونية E. coli ،Proteus mirabilis ، والزائفة الزنجارية Pseudomonas aeruginosa ) إلى الطول الموجي 650 نانومتر و هو من الاطوال الموجية الحمراء باستخدام ليزر الدايود. تأثير ذلك الطول الموجي ظهر على منحنيات النمو للأنواع الثلاث على مدى 3 أيام بعد التشعيع بالليزر. اعطت كثافة الطاقة2.8 cm2/J تأثيرا إيجابيا على منحنى النمو لهذه الأنواع الثلاثة، في حين كان لل5.6 cm2/J تأثيرا محفزا على كلا الزوائف الزنجارية P. aeruginosa والاشريكية القولونية E. coli . تم فحص القتل بالبلعمة (PKA) من قبل خلايا PMN ضد البكتيريا المشعة و اظهرال2.8 cm2/J تأثيرا نوعيا كبيرا (P <0.05) علىPKA للانواع الثلاثة من البكتيريا، ومن ناحية أخرى كان لل5.6 cm2/ J اثرا نوعيا (P <0.05) على PKA لبكتريا الزوائف الزنجارية P. aeruginosa و Proteus mirabilis. من هذه النتائج اقترح أن كثافة الطاقة 2.8 cm2/J كانت اكثر تأثيرا من 5.6 cm2/J على منحنيات النمو، وقيم PKA للأنواع الثلاث من البكتيريا. 650 nm diode laser --- Gram-negative bacteria --- Phagocytic killing Assay --- growth curve --- aerobic and facultative aerobic bacteria --- LPS. Separation of uricase from Pseudomonas aeruginosa was done using (70%) saturation ammonium sulphate, and purification of this enzyme was done by ion exchange chromatography on DEAE- cellulose column and eluted with linear NaCl (0-1M). Partial purified uricase gave an activity of (4.9 u/ml), protein concentration of (0.56 mg/ml), specific activity of (8.75 unit/mg) with purification folds (8.4) and a yield of (48%). The maximum purified uricase activity was detected at 35ºc and pH 8.5 with (0.12 mM.uric acid). The results shown that red cabbage extract (RCE) contain flavonoides which contain phenolic compounds and anthocyanines which glycoslated with mono or dimolecules of saccharides, while test for alkaloids, ster-oids, saponins and tannins were negative. Red cabbage extract (50mg/ml) have an inhibition activity against uricase compared with negative and positive control using allopurinol. So red cabbage considered as a novel inhibition for uricase whiel can used to treat gout disease in future.فصل انزيم اليوريكيز من بكتريا pseudomonas aeruginosa باستخدام (70%) كبريتات الامونيوم المشبعة, ونقي هذا الانزيم نفذت بواسطة كروماتوكرافية التبادل الايوني على عمود DEAE-cellulose والمزال معNaCl 1,0 مولر . يوريكيز المنقى جزئيا اعطى فعالية ( 9,4 وحده/مل) , تركيز البروتين (0.56 ملغ/ مل), الفغالية النوعية (8.75 وحدة/ ملغ) مع عدد مرات التنقية (8.4) والحصيله (48%ٌ) مع حامض اليوريك ( 12,0 ملي مولر. ( اعلى فعاليه لليوريكيز المنقى قيست على 35مº والاس الهيدروجيني 8.5.,النتائج تعرض مستخلص اللهانة الحمراء فلافونويدات حيث تحتوي على مركبات فينولية وانثوسيانين كلايكوسايدات مع جزيئات احادية وثنائية من السكريات بينما اختبار القلويدات ,السترويدات ,السابونينات والتانينات كان سالبا.مستخلص اللهانة الحمراء (50 ملغ/مل) لديه فعالية تثبيطية ضد اليوريكيز مقارنة مع القياسي الموجب والسالب بأستخدام allopurinol. لذا تعتبر اللهانة الحمراء مثبط جديد لليوريكيز بينما وممكن استخدامها في علاج داء النقرص في المستقبل . Extraction, Purification and Characterization Of Peroxidase From cabbage (Brassica oleracea Var) . The activity of peroxidase (POD) in cabbage was evaluated using spectrophotometric method. The enzyme was extracted from the cabbage leaves with 0.1 M phosphate buffer solution pH 7. 0 . POD activity was determined using (O-dianisidine) as a substrate. The effects of the amounts of enzyme extract, substrate concentration, pH and temperature were investigated. The highest activity of POD was recored at 2 mg/ml. The highest activity of POD was optimized with 16 mM O-dianisidine, The optimum pH was 7.0 for POD , The optimum temperature was 30°C for POD. These optimum conditions were used to determined the enzyme activities in cabbage sample. Acetone fractionated peroxidase from crude extract of Brassica oleracea leaves (Cabbage) was purified on DEAE-Cellulose chromatographic columns. The specific activity of purified POD is 103.70 (U/mg) ,which is 5.37 times more than the crude extract with 28.72% recovery. Maximum pH, thermal activity and stability of this purified enzyme are also determined were 40°C . أستخلص انزيم البيروكسديز من اوراق اللهانة , باضافة دارىء فوسفات الصوديوم بتركيز مولار 0.1 برقم هيدروجيني 7. 0 وتم تقدير الفعالية الانزيمية باستعمال المطياف الضوئي. قدرت الظروف المثلى لتفاعل الانزيم ، باستخدام تراكيز من الانزيم ، وتركيزالمادة الاساس (اورثوداي انسيدين) ، اضافة الى الرقم الهيدروجيني ودرجة الحرارة . سجلت اعلى فعالية لانزيم البيروكسديز عند تركيز 2 ملغم / مل , اما تركيز المادة الاساس اورثوداي انسيدين فقد سجلت اعلى فعالية عند تركيز16 ملي مولار وسجلت اعلى فعالية لانزيم البيروكسديز عند الرقم الهيدروجيني 7.0 ولوحظت اعلى فعالية لهذا الانزيم عند درجة الحرارة º 30م .نقي أنزيم البيروكسديز من مستخلص اوراق اللهانة باستخدام الترسيب بالاسيتون ومن ثم باستخدام تقنية التبادل الايوني وسجلت الفعالية النوعية 70 103. (وحدة / ملغم) مع عدد مرات التنقية 5.37 و حصيلة 28.72% , وكانت اعلى فعالية مسجلة للانزيم عند الرقم الهيدروجيني الامثل والثبات عند القيم 5.0 و 6.0 على التوالي. في حين اعلى فعالية مثلى وثبات عند درجة الحرارة المثلى والثبات عند 40 ºم . Elastic electron scattering form factors, charge density distributions and charge, neutron and matter root mean square (rms) radii for 24Mg, 28Si and 32S nuclei are studied using the effect of occupation numbers. Single-particle radial wave functions of harmonic-oscillators (HO) potential are used. In general, the results of elastic charge form factors showed good agreement with experimental data. The occupation numbers are taken to reproduce the quantities mentioned above. The inclusion of occupation numbers enhances the form factors to become closer to the data. For the calculated charge density distributions, the results show good agreement with experimental data except the fail to produce the hump in the central region for 28Si nucleus. Finally, the calculated charge rms radii for the nuclei under study show good agreement with experimental data. PACS number(s): 21.60.Cs, 21.60.De, 25.30.Bf, 27.10.+h, 27.20.+n تمت دراسة توزيعات كثافة الشحنة للحالة الأرضية وعوامل التشكل للاستطارة المرنة بالإضافة إلى أنصاف الأقطارالشحنية والنيوترونية والكتلية للنوى 32S and 28Si, 24Mg ، باستخدام اعداد الاشغال. تم استخدام االدوال الموجية القطرية لجهد المتذبذب التوافقي. بالنسبة لنتائج عوامل التشكل الشحنية المحسوبة باستخدام نموذج القشرة, اظهرت النتائج تطابق جيد مع النتائج العملية. حيث تبين ان استخدام تاثير اعداد الاشغال للمستويات المختلفة يجعل النتائج اقرب للقيم العملية. كما أظهرت النتائج تطابق جيد بين توزيعات الكثافة الشحنية المحسوبة والقيم العملية باستخدام نموذج القشرة ماعدا عدم التنبؤ بالسنام او القمة الموجودة في توزيعات الكثافة الشحنية لنواة 28Si. اخيرا فيما يخص قيم انصاف الاقطار الشحنية المحسوبة فتم توليدها بنجاح لتطابق العملية المقابلة لها. stable nuclei --- shell model --- charge density distribution --- elastic charge form factor --- rms charge --- neutron --- and matter radii. Clastic-carbonate succession which including the Nahr Umr and Mauddud Formations are represented a part of Albian-Early Turonian Sequence (Wasi`a Group). 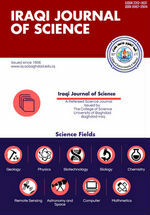 The present study includes Petrography, microfacies analysis, depositional environment, digenetic development, and reservoir characterization for seven boreholes (Lu-2, Lu-4, Lu-5, Lu-8, Lu-13, Lu-14 and Lu-39) within Luhais Oil field South Iraq. There are six type of carbonate microfacies were recognized in the Mauddud Formation:- Orbitolina - Milliolids wackestone to packstone Orbitolina wackestone to packstone, miliolids wackestone, Peloidal wackestone to packstone, Ooides to Peloids grainstone and bioclastic Wackestone - Packstone. These microfacies are represented three depositional environments: restricted shallow marine environment, semi-restricted shallow marine environment and Shoal environments. While the Nahr Umr Formation characterized by six lithofacies; Lithofacies I (Mudstone), Lithofacies II (Siltstone - Claystone), Lithofacies III (Lenticular Bedded Sandstone-Mudstone), Lithofacies IV (Falser Bedded Mudstone - Sandstone), Lithofacies V (Parallel Lamination Sandstone - Siltstone) and Lithofacies VI (Well sorted sandstone). These lithofacies are suggested four depositional environment of Nahr Umr Formation: Active channel environment, channel fill environment, delta plain environment and delta front and shore face environment. The most common diagenetic features observed and distribution in the studied sections includes Micritization, Cementation, Leaching (dissolution), dolomitization and Compaction fabrics. The most effective diagenetic processes were cementation, dissolution and dolomitization processes which have direct affect upon the study sections. The Nahr Umr and Mauddud sequence can be divided by the gamma ray and shale value into three zones (A, B and C); therefore we have interpretation of the logs porosity and porosity evaluation according to these divisions. أن التتابع ألفتاتي _الكاربوني الذي يتألف من تكويني نهر عمر ومودود يمثل جزء من دورة الالبين _التوروني المتقدم (مجموعة وسيعة) أما الدراسة الحالية تتضمن دراسة طبوغرافية وتحليل سحنات وبيئة رسوبية وتطور العمليات التحويرية ودراسة الخواص المكمنية لسبعة أبار نفطية (2,4,5,8,13,14,39 ) في حقل اللحيس النفطي في جنوب العراق. تم تمييز ستة أنواع من السحنات الصخرية في تكوين مودود:- (Orbitolina - Milliolids wackestone to packstone Orbitolina wackestone to packstone, miliolids wackestone, Peloidal wackestone to packstone, Ooides to Peloids grainstone and bioclastic Wackestone-Packstone). وهذه السحنات تمثل الترسبات في ثلاث بيئات ترسيبية : البحرالمفتوح الضحل وشبه الضحل المحجوز وبيئة الحاجز الرملي Kبينما يتميز تكوين نهر عمر بستة سحنات صخرية: - Mudstone Lithofacies, Siltstone-Claystone Lithofacies, Lenticular) Bedded Sandstone – Mudstone Lithofacies and Falser Bedded Mudstone – Sandstone Lithofacies). حيث تمثل هذه السحنات الترسيب في بيئة القناة الفعالة وترسبات ملئ القناة ومقدمة الدلتا وواجهة الساحل. فإن الخواص التحويرية الأكثر شيوعا في التتابع المدروس هي المكرتة والسمنتة والاذابة والدلمتة والتراص. والأكثر تأثيرا هي السمنتة والاذابة والدلمتة والتي تؤثر بشكل مباشر وواضح في الخواص البتروفيزياوية للتتابع المدرس. Concentrations of 137Cs were measured in 40 samples that have been selected from the surface soil in cities of Ramadi, Fallujah, Heet and surrounding areas. The activity of 137Cs in seven dust storms that hit the area western of city of Ramadi within the period 1/3/2013-1/10/2013 was measured also. The concentration in soil ranges between (below detection level-14.5) Bq.kg-1, while it ranges between (7.5-8.8) Bq/kg in the dust storms. The dose due to exposure to the cesium in surface soil was estimated to be ranged between (0.4-7.7) *10-2 mSv.y-1 while the effective doses due to inhalation of resuspended 137Cs was about 1.61*10-8 and the doses caused by inhalation of 137Cs in dust storms is ranging between (8.13-9.54)*10-7µSv/y. This study gives evidence that dust storms contribute in moving of 137Cs and other pollutants from their origin contaminated areas. The source of 137Cs may be not far away from the study region which depends on the direction of the permanent wind in the region, and the location of the study area relative to the source and direction of the dust storms. جرى في هذا البحث قياس تراكيز السيزبوم-137 لـ 40 عينه من ترب سطحية منتخبة من مدن الرمادي والفلوجة وهيت والمناطق المجاورة لها. كما قيس النشاط الاشعاعي لسبع عينات لعواصف ترابية ضربت مدينة الرمادي للفترة من 1/3/2013 لغاية 1/10/2013. تراوحت التراكيز المقاسة ما بين (اقل من مستو تحسس الجهاز-14.5) بكريل/كغم في حين تراوحت تراكيزه بين (7.5-8.8) بكريل/كغم في العواصف الترابية. قدرت الجرع الاشعاعية الناتجة عن التعرض للسيزيوم- 137 في التربة السطحية وكانت بحدود (7.7-0.4) x10-2 ملي سيفرت/سنه (mSv.y-1) وبمعدل 0.8 ×10-2 ملي سيفرت/سنه. بينما الجرع نتيجة لاستنشاق السيزيوم االعالق في الهواء كانت بحدود 1.61 × 10-8 سيفرت/سنه اما الجرع نتيجة استنشاق الهباء فتراوحت ما بين (8.13×10-7- 9.54×10-7) مقدره بوحدات مايكروسيفرت/سنه. اعطت الدراسة دليلا على ان العواصف الترابية تساهم في نقل السيزيوم والملوثات الاخرى, من مناطق تلوثها وقد يكون مصدر السيزيوم ليس بعيدا عن منطقة الدراسة, متأثرا بذلك باتجاه الريح السائد التي تهب الى المنطقة وموقع منطقة الدراسة نسبة الى مصدر العواصف الترابية. Cesium --- soil --- aerosol --- dose --- radiation in Iraq. Concentrations and distribution of major, minor, and trace elements were studied in thirteen sediment samples from Al-Hammar Marsh. Multivariate statistical techniques such as Principal Component Analysis (PCA) and Agglomerative Hierarchal Cluster Analysis (AHCA) as well as pollution analysis such as Enrichment Factor (EF) were used to process the data and identify the possible sources of elemental constituents in sediment samples.Results of chemical analysis revealed that Major element mean concentrations were in the order of Ca> Si> K> Mg> and minor elements were in the order of Al> Fe>S>Cl> Ti> P>Mn> Sr> N and trace elements were in the order of Cr> Ni> Zr>V>Zn> Cu>Br> Co>Pb >Mo>As>U> Se> Cd. Mainly increasing of Salinity in Marsh water and sediments led to increasing of Mg, S, Ca, Br, Cl concentrations in Al-Hammar Marsh Sediments. Multivariate statistical techniques PCA and AHCA revealed that V, Zn, As, Se, Mo, Pb, Co, Fe, Ni, and Cu were most probably derived from fertilizers and petroleum extraction wastes in and near the study site. U (at St1) and Sr came from fertilizers and for U might be from military weapon. Br, Cd, Cl, Ca, S, P and N indicated anthropogenic source (fertilizers, animal waste, and domestic sewage). While Mg, Cr, Mn were mainly associated with anthropogenic activities (fertilizers and animal wastes). On the other hand Al, Si, Ti, K, and Zr were primarily of natural sourcing from erosion of parent rocks. Enrichment Factor gave compatible results with PCA and AHCA findings and revealed that Al-Hammar Marsh sediments were highly contaminated by S, Mg, Cl, Ca, P, Br, Se, Mo, Ni, Co, Cu, and Sr. and it were minimally contaminated by Zn, V, U, Cr (excluding S3), As, Fe, Mn, and N. تركيز وتوزيع العناصر الرئيسية والثانوية والشحيحة قد درست في ثلاثة عشر عينة من رواسب هور الحمّار. قد تم تطبيق تقنيات Agglomerative Hierarchal Cluster والتحليل العنقودي Principal Components analysis التحليل الاحصائي المتعدد المتغيرات تحليل التلوث (عن طريق حساب معامل الاغناء) قد استخدمت من اجل معالجة المعلومات وتعيين المصادر المحتملة وكذلك Analysis للعناصر الكيميائية المكونة للرواسب. وفيما يخص نتائج التحليل الكيميائي كشفت ان معدلات التركيز للعناصر الرئيسية كانت موزعة بالترتيب التالي في الرواسبCa> Si> K> Mg> اما تركيز العناصر الثانوية كانت موزعة بالترتيب التالي Al>Fe>S>Cl>Ti>P>Mn>Sr>N توزيع العناصر الشحيحة كانت بالترتيب التالي.Cr> Ni> Zr>V>Zn> Cu>Br> Co>Pb >Mo>As>U> Se> Cd كشفت عن ان المغنسيوم والكروم والمنغنيز كانت مشتقة من مصادرPCA وAHCA تقنيات التحليل الاحصائي المتعدد المتغيرات غير طبيعية اي من الانشطة البشرية والتي هي الاسمدة ومخلفات الحيوانات. اما عناصر البروم والكادميوم والكلورايد والكالسيوم والكبريت والفسفور والنايتروجين فان مصدرها هو الانشطة البشرية وتتمثل بالاسمدة ومخلفات الصرف الصحي ومخلفات ألحيوانات بينما فيما يخص الفانديوم والخارصين والزرنيخ والسيلينيوم والمولوبيدنيوم والرصاص والكوبالت والحديد والنيكل والنحاس فان المصدر المحتمل لهذه العناصر هو الاسمدة ومخلفات الاستخراج النفطي في وبالقرب من منطقة الدراسة. اليورانيوم والسترانتيوم مصدرهما الاسمدة اما اليورانيوم ربما يكون مصدره ايضا من الاسلحة الحربية. من الجانب الاخر فان الالمنيوم والسيلكون والتيتانيوم والبوتاسيوم والزركون كان مصدرهم طبيعي من تعرية المواد الجيولوجية. وبينت ان رواسب هور الحمّار كانت (PCA ( و (AHCA) كانت النتائج المستحصلة من معامل الاغناء متوافقة مع نتائج التحليل الاحصائي ملوثة تلوثا كبيرا بالمغنسيوم والمنغنيز والكلورايد والكالسيوم والفسفور والبروم والسلينيوم والمولوبودنيوم والنيكل والكوبالت والنحاس والسترانتيوم . اما فيما يخص عناصر الخارصين والفانيديوم واليورانيوم والكروميوم والزرنيخ والتيتانيوم والمنغنيز والكروم والنايتروجين فقد كانت الرواسب ملوثة تلوثا واطثا بها. Sediments --- Multivariate statistical techniques --- pollution analysis --- Al-Hammar Marsh. In this note we consider a generalization of the notion of extending modules namely supplement extending modules. And study the relation between extending and supplement extending modules. And some properties of supplement extending. And we proved the direct summand of supplement extending module is supplement extending, and the converse is true when the module is distributive. Also we study when the direct sum of supplement extending modules is supplement extending. تم في هذا البحث أعطاء تعميم لمفهوم مقاسات التوسع بأسم مقاسات التوسع المكملة. ودرسنا الخواص الرئيسية لمقاسات التوسع المكملة. ودرسنا العلاقة بين مقاسات التوسع ومقاسات التوسع المكملة. و برهنا أن كل مركبة جمع مباشر لمقاسات التوسع تكون مقاس توسع,وبرهنا أن الجمع المباشر لمقاسات التوسع المكملة يكون مقاس توسع مكمل بشرط أن يكون المقاس قابل للتوزيع. Closed submodule; Supplement submodule;Extending modules. Peristaltic transport --- Slip condition --- Variable viscosity --- MHD fluid --- Porous medium. Let m ≥ 1,n ≥ 1 be fixed integers and let R be a prime ring with char (R) ≠2 and (m+n). Let T be a (m,n)(U,R)-Centralizer where U is a Jordan ideal of R and T(R) ⊆ Z(R) where Z(R) is the center of R ,then T is (U,R)- Centralizer. ليكن m ≥ 1 و n≥ 1 عددان صحيحان و R هي حلقة اوليه حيث ان char (R) ≠2, (m+n). ليكن T تمركز- (U,R) من النوع (m,n) عندماU مثالي جوردان في R و T(R) ⊆ Z(R) حيث ان Z(R) هو مركز الحلقة R , فان T تمركز- (U,R) . Prime ring --- Semiprime ring --- Left (right) Centralizer --- Left(right) Jordan Centalizer --- (m --- n)-Jordan Centralizer --- Left(righ)(m --- n)(U --- R)-Centralizer --- (m --- n)(U --- R)-Centalizer. In this paper, we study the solvability of two operator equations A X B+ X^*=C (1) and A X B+B^* X^* C=D (2) Where A, B, C and D are bounded linear operators. We give the necessary and sufficient conditions for the existence of a solution of equation (1), and describe the general form of the solution in the solvable case for both equations by using g-inverse of the operator B. في هذا البحث, درسنا أمكانية الحل لمعادلتي المؤثرات A X B+ X^*=C و كذلك A X B+B^* X^* C=D حيث أن A ,B, C وD مؤثرات خطية مقيدة كذلك أعطينا الشروط الضرورية و الكافية لوجود الحل للمعادلة (1),أيضا أعطينا صيغة الحل العام لكلا المعادلتين باستخدام معكوس-g للمؤثر B. Most includeding techniques of digital watermark even now working through the direct inclusion in the pixel without taking into account the level of compression (attack) that can go wrong, which makes digital watermark can be discarded easily. In this research, a method was proposed to overcome this problem, which is based on DCT (after image partitioned into non overlapped blocks with size 8×8 pixel), accompanied by a quantization method. The watermark (digital image) is embedded in DCT frequency domain seeking the blocks have highest standard deviation (the checking is only on the AC coefficients) within a predetermined threshold value, then the covered image will compressed (attacked) varying degrees of compression. The suggested methodology enables user to extract digital watermark even when the digital image compressed to low level bit ratios was showed in tables. معظم تقنيات تضمين العلامة المائية الرقمية الان تعمل من خلال التضمين المباشر في عنصر الصورة بدون الاخذ بنظر الاعتبار مستوى الضغط (الهجوم) الذي يسبب اخطاء بحيث يجعل استخراج العلامة المائية الرقمية عملية صعبة. في هذا البحث تم اقتراح طريقة للتغلب على هذه المشكلة اعتمادا على تحويل الجيب تمام الخطي (بعد تقسيم الصورة الى مربعات/بلوكات غير متراكبة بحجم 8×8 عنصر صورة) مضافا اليه طريقة تكمية. يتم تضمين العلامة المائية(صورة رقمية) في الحيز الترددي لتحويل الجيب تمام من خلال البحث عن البلوكات التي تمتلك اعلى قيمة معيارية (الفحص يكون فقط على قيم المكافئات الترددية التناوبية) لاتتجاوز قيمة عتبة محددة مسبقا، ومن ثم يتم ارسال البيانات المضمنة الى منظومة ضغط بيانات لافقدية (مرمزات الازاحة و وهوفمان) واعادة الاجرائات السابقة بالعكس وصولا الى استخراج العلامة المائية. لكي نختبر قوة الطريقة المقترحة ومدى صمود العلامة المائية ضد الضغط الذي قد تتعرض له الصورة المضيفة. تم تعريض الصورة المضيفة للعلامة المائية لدرجات مختلفة من نسب الضغط. النتائج التي حصلنا عليها بينت ان المنهجية المقترحة تمكن المستخدم من استخراج العلامة المائية حتى اذا تم ضغط الصورة الرقمية الى مستويات ضغط منخفضة. تم توضيح نسب الضغط وجودة العلامة المائية المستخرجة بعد الضغط في جداول خاصة اعدت لهذا الغرض. In this research, the influence of the distance factor on the optimal working frequency (FOT) parameter has been studied theoretically for the ionosphere layer over the Middle East Zone. The datasets of the (FOT) parameter have been generated using the (VOACAP) model which considers as one of the recommended modern international communication models that used to calculate the ionosphere parameters. The calculations have been made for the connection links between the capital Baghdad and many other locations that distributed on different distances and directions over the Middle East region. The years (2011-2013) of the solar cycle 24 have been adopted to study the influence of the distance factor on the FOT parameter. The results of the conducted study showed that the distance factor has a clear influence on the values of the FOT parameter, also the day/night effect is more significant in the long distance HF links (i.e. more than a 500 Km). تم في هذا البحث إجراء دراسة نظرية لحساب تأثير عامل المسافة على معامل التردد المستخدم الأمثل (FOT) لطبقة الأيونسفير فوق منطقة الشرق الأوسط. تم استخدام نموذج الاتصالات العالمي الـ VOACAP الذي يعد واحد من أفضل النماذج العالمية المعتمدة لحساب المعاملات الأيونسفيرية. لقد تم أجراء حساب قيم معامل الـ FOT لوصلات الاتصال بين العاصمة بغداد والعديد من المواقع الموزعة على مسافات واتجاهات مختلفة فوق منطقة الشرق الأوسط. كما تم أختيار الأعوام (2011, 2012 و 2013) والتي تقع ضمن الدورة الشمسية (24) لأجراء أختبار تأثير عوامل الاتجاه، المسافةعلى الـ (FOT). أظهرت النتائج أن لعامل المسافة تأثير واضح على قيم معامل الـ FOTكما أوضحت الدراسة أيضاً أن تأثير تغاير النهار/الليل قد ظهر بشكل ملحوظ على وصلات الاتصالات بعيدة المدى )أي المسافة الأكثر من 500 كيلومتر(. Optimal Workable Frequency (FOT) --- HF communication --- Ionospheric Parameters. Monitoring of environmental variations of marshes in Iraq using Adaptive classification method. The object of the presented study was to monitor the changes that had happened in the main features (water, vegetation, and soil) of Al-Hammar Marsh region. To fulfill this goal, different satellite images had been used in different times, MSS 1973, TM 1990, ETM+ 2000 and MODIS 2010. K-Means which is unsupervised classification and Neural Net which is supervised classification was used to classify the satellite images and finally by use adaptive classification which is apply supervised classification on the unsupervised classification. ENVI soft where used in this study. مراقبة وحماية هور الحمار ومكوناته (ماء ونبات وتربة ) هي الشاغل الرئيس للعديد من المؤسسات الدولية والمحلية. اقمار التحسس النائي عالية الدقة هي الاداة المهمة المستخدمة لجمع المعلومات عن الاهوار لتقييم مكوناته من ماء وتربة ونبات. المنطقة المدروسة هي هور الحمار احد الاهوار الكبيرة في جنوب العراق. والذي يعتبر احد المناطق المهمة طبيعيا لاحتوائه على الاسماك والنباتات النادرة. استخدمت طريقة التصنيف (K-mean) وطريقة التصنيف (Neural Net ) لتصنيف صور الاقمار الصناعية واخيرا استخدمت طريقة مطورة والتي تتضمن تطبيق طريقة التصنيف المرشد على صورة طبق عليها التصنيف غير المرشد. استخدم برنامج ال ENVIفي هذا العمل.